The Court rejects Trump’s claim that his travel ban is immune from “any review”— that the courts can’t consider (much less decide) whether it’s legal— and explains why it’s plainly unconstitutional. In so doing, the decision makes clear the truly disturbing danger we face. America was founded on the principle that no one is above the law. President Trump doesn’t believe that. He proves it every week. Last week, we learned Trump asked FBI Director James Comey to “let go” of the investigation of his national security advisor’s contacts with the Russians, requested Comey’s “loyalty” pledge, and fired Comey over “this Russian thing” when he didn’t get it. Trump then told the Russians Comey was a “nutjob,” shared sensitive information with them, and insisted he had the “absolute right” to do so. This week, it’s the travel ban. Next week, who knows? America is a democracy, not a dictatorship or monarchy. The U.S. Constitution ensures separation of powers because the Founders did not trust one person– or even one branch of government – to have absolute power. But that’s what President Trump insists he has. Trump believes this. Just look at his words and actions. As a candidate, Trump called for a blatantly-unconstitutional “complete and total shutdown of Muslims entering the United States.” As President, he quickly issued what his advisor, Rudy Giuliani, said was designed to be a legal “Muslim ban.” No such thing exits. Trump barred travel from seven nearly-100% Muslim nations. He gave Christians preferential treatment, despite the First Amendment. His order even violated the law it’s based on, which says, “No person shall … be discriminated against in the issuance of an immigrant visa because of … nationality, place of birth, or place of residence.” When the order was blocked, Trump issued what he called a “watered-down version” instead. Campaigning, Trump vowed to “bring back waterboarding” and “a hell of a lot worse” because “torture works.” Federal law and international treaties prohibit torture. Within days of becoming President, ignoring those laws, Trump said he would “defer” to Defense Secretary James Mattis on whether to use torture. Candidate Trump said that “nobody should be allowed to burn the American flag” and suggested “loss of citizenship” or a “year in jail.” The Supreme Court, including Justice Scalia, held decades ago that flag burning is protected by the First Amendment. The Constitution doesn’t matter to Trump as President either. Article I of the Constitution grants Congress the spending powers. Article II requires the President to faithfully execute the laws. The Supreme Court has repeatedly held that, when Congress has allocated funds, the President cannot constitutionally withhold them. The Court has also consistently held that, under the Tenth Amendment, “the Federal Government may not compel the States to enact or administer a federal regulatory program.” Trump’s unconstitutional “sanctuary city” order—which would deny federal funding to cities that don’t enforce federal immigration laws—does all of these things. The Constitution’s “Emoluments Clause,” designed to prevent conflicts of interest, forbids the President, “without the consent of Congress,” from accepting “any present, Emolument, Office, or Title, of any kind whatever, from any King, Prince, or foreign State.” (An emolument is a payment or something of value.) Trump is openly violating it. When watchdog groups asked U.S. Attorney Preet Bharara to investigate, Trump fired him. Instead of placing his assets in a blind trust to avoid conflicts of interest, like previous Presidents, Trump said “the President can’t have a conflict of interest.” Of course he can—and does. Why did his travel ban target countries where he has no business and from which no terrorists have killed people in America, but exempt countries where Trump has business and the 9/11 terrorists came from? Numerous federal statutes authorize agencies to issue regulations when their benefits would outweigh their costs. Trump just ordered that two regulations be rescinded whenever one is issued and that the costs of new regulations be zero, regardless of their benefits —a flagrant violation of the law. Trump is acting like he can’t be touched. But he can be. Even if Congress and the Justice Department can’t or won’t do their jobs, Trump can still be held accountable—in the courts. 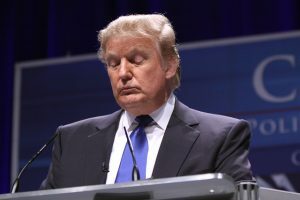 In the original travel ban appeal, when Trump insisted his power was “unreviewable,” the U.S Court of Appeals for the Ninth Circuit responded: “There is no precedent to support this claimed unreviewability, which runs contrary to the fundamental structure of our constitutional democracy.” The Fourth Circuit just agreed, rejecting “nonreviewability” as “a dangerous idea” involving “judicial abdication, especially where constitutional rights, values, and principles are at stake.” The courts barred the original ban and Trump’s “watered-down version,” too. Lawsuits are now challenging Trump’s violations of the Constitution, the Post Office lease, and the federal laws governing regulations. More are surely on their way. So Trump is trying to bully the courts. Expect more ahead. Trump has already called Chief Justice Roberts an “absolute disaster.” How long before he insults the Fourth Circuit, too? But we are governed by law. President Trump needs to learn that. The courts must teach him a basic American lesson: In this country, no one is above the law.